When it comes to legislative action that the public considers essential this year, dealing with the deficit far and away ranks at the top of the list; 70% say it is essential for the president and Congress to act on this in 2013. By comparison, other initiatives highlighted in President Obama’s inaugural and State of the Union addresses – major immigration legislation, gun legislation and new climate change policies – do not rank nearly as high. 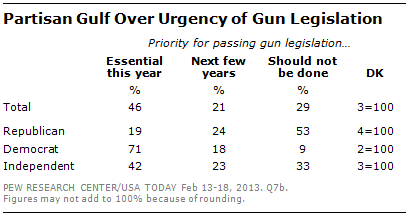 Just under half the public (46%) say passing gun legislation this year is essential. About a fifth (21%) say passing gun legislation is something that can be done in the next few years while 29% say there should be no new gun laws. Overall, the public remains divided over gun control in a February survey conducted about two months after the shootings in Newtown, Conn. Half (50%) say controlling gun ownership is the more important priority, while 46% say protecting the right of Americans to own guns is more important. Just as Republicans and Democrats are divided over whether the priority should be controlling gun ownership or protecting gun rights, there is a partisan gap when it comes to the importance of passing major gun legislation. 7 facts about guns in the U.S.